We are now two for two on lodging that has boasted high-speed wireless internet to find that it is neither high-speed nor (in some cases) wireless. It makes for some painfully slow uploading of photos from the trip, so forgive me if my posts are getting brief on text after waiting far too long to get the pics up. We just don’t have the time. I promise to answer comments when time permits – probably after we return home. But to answer some of the inquiries about my photos… yes, I do sell them. If you are interested in purchasing, contact me via email (see the About page for addy) and I’ll give you pricing info, etc. I haven’t had the time or energy to get a proper commercial site set up just yet, but it is in the works. Now… where are we? We are currently in Lee Vining on the eastern side of Yosemite National Park. The Eastern Sierra is where it’s at for us. I first fell in love with backcountry wilderness in the Sierra Nevada. 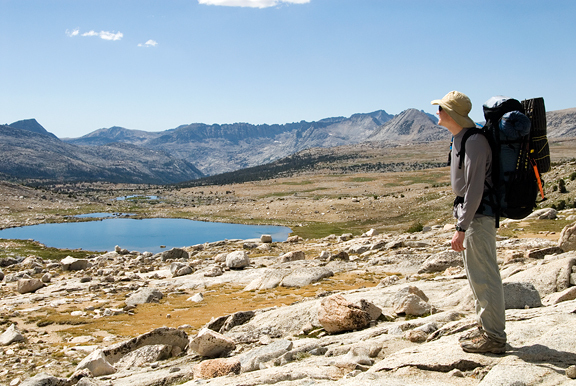 It’s a large mountain range with hundreds of miles of trails, days from the nearest road. Jeremy and I have spent several years exploring these mountains and we are still discovering new trails, new destinations, new wonders here. This morning we hiked out over Piute Pass after an overnight to Desolation Lake where I spent the wee hours of the morning shooting the Perseids meteor shower. I can’t process those images on my laptop, so you’ll have to wait for the results just like me when I get home. It’s hot here. We knew that. But it is worth it to get back into familiar terrain and smell the forests, the willows, the sage brush, the streams. Monday morning, we left Pasadena at 4 am and drove to the ranger station in Lone Pine to secure a permit. Because flying with backpacking stoves has become a complete hassle (nearly impossible, really), we tend to make our short summer backpacks cold – as in stoveless or non-cook. We popped by a favorite bakery along the 395 corridor and scored some lovely ham and cheese croissants, then headed for the trail where we packed our gear and set off at noon – far later than we ever like to start. I managed a few hours of sleep before I had to get out of the tent and set up to shoot the meteor shower after the moon set at 1:48 am. I went back into the tent at 3:00 am after seeing about 40 shooting stars and perhaps capturing 10 that I was aware of (the camera can get more than your eye can see – so who knows what I will end up with). Sunrise was lackluster and not worth getting up at 5:30 for, but by then we were itching to clear out to beat the heat. We didn’t beat the heat, but we hiked out in good time and secured our permit for tomorrow’s backpack trip. On the excellent advice of some of my field engineer friends as well as Todd and Diane, we stopped by the Whoa Nellie Deli in Lee Vining for lunch. It’s a Mobil gas station that serves up surprisingly amazing food. I wouldn’t go so far as to call it gourmet as many claim – but if you consider the setting, it’s as good as it gets for such a small town with so much thru traffic. 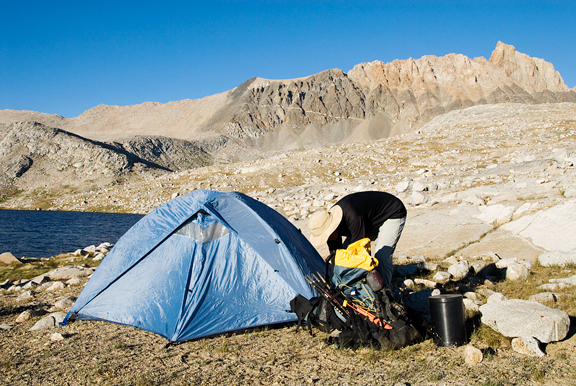 And besides, food tastes infinitely better when you’ve been backpacking. Time to hit the hay, kids. I have a date with more meteors in a few hours and then we return to the backcountry. See you on the other side! Hey, best presentation among gas-station restaurants, 2007 and 2008! Kidding :) Well, it does look good! Better than some Mexican restaurants here. Looking forward to the rest of your shots, Jen! Take care! Those pictures never seize to amaze me! That part of the country is stunningly beautiful! Nice food too! I was so hoping y’all had included the Perseids in your vacation plans! I had my alarm set to go watch the heaviest part (early morning of the 12th I understood) it is a waste of time to try to see anything else here in the heart of Dallas, but we had heavy cloud cover and I rolled back over. I look forward to your photos. Can’t wait to see the photos of the shooting stars…the food at the Mobile restaurant looks pretty good!!!! I am so living vicariously through your vacation. What a fun time! Those fish tacos do look great! Wow, thats all very exciting! That makes me feel better about that area now, we got stuck after a mudslide for 3 hours on the 395 and it stopped me wanting to go back there again, maybe I’ll reconsider! What beautiful flowers! They kept me going on my recent bike ride up there. What a fun adventure you are on. I love the photographs and look forward to seeing the shooting stars. You are so talented Jen! Those fish tacos looked so good – I can’t believe they came from a gas station. Aw, man, seeing pics of the Sierras, the granite, and of the Mobil food makes me soooooooooooooo nostalgic. I’m so happy you guys are there to enjoy it all (and it sounds like you are)! Can’t wait to hear more about it…. Haha! The minute I read Lee Vining, it thought “I wonder if they know about the gas station with the amazing food?” I should have known you’d find your way. That tent: it is so leeettle. Guess I’ve been spending too many years doing the car camp thang. My tent is friggin huge, with an attached screen “porch” that I could cook in if I needed to . Really, it’s sort of embarrassing. You should see my camp kitchen though. Ain’t nothing I can’t cook in it. Nice blog! Love the pics and the recipes. My kind of food! By the way, I always use real butter. Amazing color in these photos, especially the food ones! We love it up there (Lenny is a CLIMBER) & have yet to try that place out for eats. But, we always drive by and say, we spend a night here, just to see what it is like. But, then we decide to stay in our favorite hotel – back of the jeep or tent somewhere in the valley dining on Chez US stuff! Really can’t beat sleeping under the stars, huh?! Have fun! your trip only gets better and better!! I can’t wait to see the shots you captured from the meteor shower!! enjoy the rest of your vacation!! Totally worth the wait though, those Wildflowers are stunning, aren’t they? Like Lucky Charms…Flora Charms? 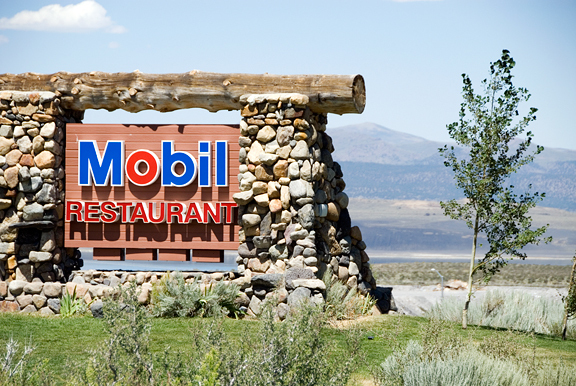 I love the Mobil restaurant, too! I’m at my absolute happiest when, after a day of climbing in Tuoloumne, we drive down the hill to eat fish tacos and salads and drink mango margs. And sitting outside, listening on the conversations of the climbers, hikers, birders and tourists around me, while looking around the Sierra and breathing cool mountain air, well…I could – and do – sit there for hours. Looks like a great trip! Here’s my idea for the net one: Skiing with Butter and Fig. You name the mountain, I’ll be there! Your pictures are something else… The colors are mesmerizing. What a treat! Enjoy the rest of your trip. I have hiking envy again and always!! I can’t wait for the pictures of the meteor shower! I’m just back from Denali National Park in Alaska and there are some parts of the park that look very much like the area you two explored. Cool. 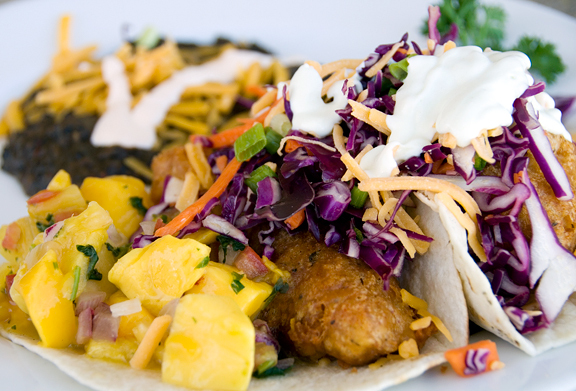 BTW, I could eat one of those fish tacos right now. 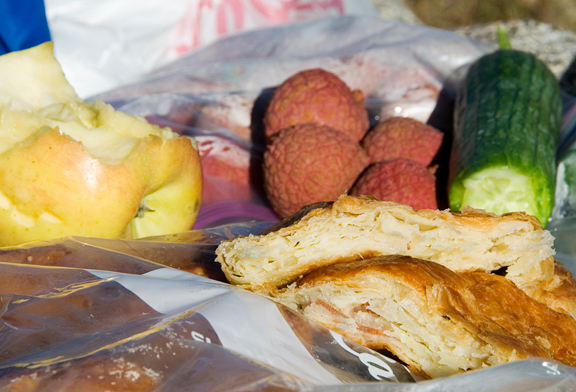 I totally agree that food tastes better when you’re backpacking. Bet that was a pricey gas station lunch, huh? About $40? 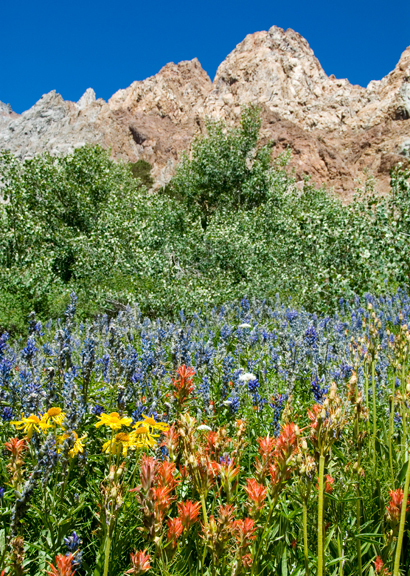 The Eastern Sierra is so magnificent and you’ve captured it beautifully. I get goosebumps when I see the spiked peaks of the Eastern Sierra’s and the high Sierra lakes. It feels like home. THAT PLACE is MY FAVORITE east side restaurant (whoa nellie deli). Mammoth has NOTHING to eat. I should have warned you though – stay away from the ‘lobster’ taquitos…..the only thing matt toomey didn’t get right. the caesar steak salad though? WELL worth the drive. Mrs. E – they’re up now! Rosa – it really is a gorgeous place to visit. Hope you’ll come out and see it some day! Elizabeth – thanks. It wasn’t as successful as I had hoped. I need more practice! Debbie – they’re up on the photo blog! Jennywenny – oh, it can be difficult traveling 395 sometimes. But the area is gorgeous and definitely worth a second chance! Pam – thank you :) I know, the Mobil station is such a delightful surprise! Cindy – yes, the tent is small because we hate to carry a boatload of weight when we backpack :) Small profile is also more efficient at shedding wind. Your camp kitchen sounds intriguing! Chez Us – Oh, I imagine you guys have spent a good deal of time up that way. Isn’t it awesome? I can’t ever get enough of the Eastern Sierra. Tony – thanks, my dear! Graeme – oh, you are too funny. It’s maddening. Why hasn’t anyone fixed the internet slowass problem?? :) I like to think of the colors as popsicle flavors, myself! Katie – I can envision you sitting out there listening to folks after a day of climbing! Fun times, no? We have to get together out there and play. WoRC – about $30… still, the fish tacos were GOOD. It really does call to you, doesn’t it. I love the Eastern Sierra. LOVE IT! 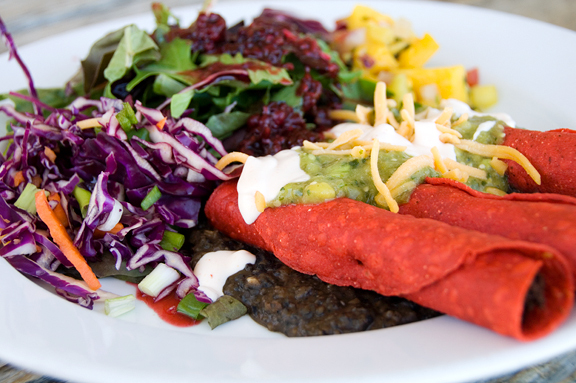 Gwendomama – we haven’t eaten in Mammoth much (good to know that we weren’t missing out!). Yeah, Jeremy said the tacquitos were nothing to write home about.